There’s been a flurry of attention lately about the move The Weather Channel has made on naming winter storms. The network, which has been on the air since 1982, has stood behind the move that has been getting frosty reviews by many. While as a Floridian I live in a state that is lucky if it sees a dusting of flurries once every couple of years, I am no stranger to the idea of naming storms. Do the names Andrew, Charley, or Donna ring a bell, anyone? Of course, here in Florida, we get acquainted to a whole batch of names every year in the Sunshine State as the National Hurricane Center, the authority on naming tropical storm systems, releases its annual litany of hurricane names. The practice of naming hurricanes, which has been in official use by the weather service since 1953, is designed to help reduce confusion by trackers and the public at large when two or more tropical systems have formed. This followed the longstanding tradition of the Caribbeans, who would name landfalling hurricanes after the saint of the day on the Roman Catholic Liturgical Calendar. So, if hurricanes get to have names, then why not name winter storms, too, right? 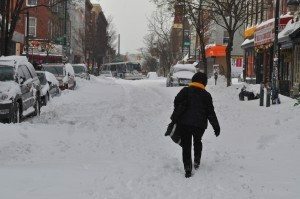 The Weather Channel says it is naming winter storms ease communication when reporting on winter weather and to give the public a simpler way of following snowstorms in an increasingly mobile, social media-driven world. Besides, it’s not as if we haven’t named winter storms before. Take, for example, Snowmageddon, which is a clever portmanteau combining snow and Armageddon – the latter being what the February 2010 storm seemed like to many residents of the Northeast, many of whom were without power for several days after being buried by feet of snow in some places. But what exactly constitutes a snowstorm worthy of being named? And, why is The Weather Channel doing this now? While Europe has been naming winter storms since the 1950s, the United States has yet to institute an official winter storm naming system. While naming winter storms isn’t a bad idea, per se, what has happened is that a cable television station has taken it upon itself to name winter storms, a move which looks like little more to me than a way to drive up the ratings when there aren’t any hurricanes to talk about. What this also serves to do is trivialize the authority of the National Weather Service, which is usually the deciding body on all major issues regarding the weather that affects the United States. Perhaps if there had been a national discussion on the naming of winter storms, fewer people, including myself, would be disenchanted with the idea of named winter storms. Instead, The Weather Channel has unilaterally decided to name the winter weather, without any further questions asked. So, what if another news agency decided to start naming winter storms, too? And, what if that network chose its own, random names? There would be mass confusion. And, the last thing anyone wants during severe weather is confusion. The reality is, people don’t just make up hurricane names and apply them to whatever stormy tropical weather appears on the weather map. There is a meticulous system that goes into deciding what names should be given and precisely when to name a storm. And, this rule applies every year and is followed by everybody tracking hurricanes. In the case of tropical weather, a storm system brewing in the Atlantic, say, during the heart of August, only gets named after it reaches a sustained wind speed of 39 miles per hour. That’s when it officially becomes a tropical storm. Now, as that storms strengthens (and, if it’s an Atlantic storm churning up the waters in the middle of August, it likely will) and becomes a hurricane (which has sustained winds of at least 74 miles per hour), it still keeps its original name. In other words, once a storm gets a name, that name won’t change, no matter how strong the system gets. So, in reality, while we’re all accustomed to talking about Hurricane Billy Bob or Hurricane Mary Jane, they would have started out as Tropical Storm Billy Bob or Tropical Storm Mary Jane. By the way, hurricanes in the Atlantic basin are given names from a list that rotates on a six-year cycle and since 1979 has included alternating male and female names typical of those among the people of North America, France, and Spain; the names of particularly devastating storms, such as Andrew and Katrina, are retired from use. So, if a winter storm is to also be named, deciding when and for how long it will have a name will have to determined. The rules of defining a winter storm will be different than those for a tropical system, of course. Sure, blizzards are windy, but their primary poison is snowfall, and lots of it. Perhaps an average snowfall rate per hour in the most severe area of the storm, wind speeds, and visibility would be three factors that should be the basis on determining when a winter storm should be named. Say, for example, a snowstorm with average snowfall rates of 1 to 2 inches per hour or more, winds of 25 miles per hour or greater, and visibility under a half mile. Whatever requirements a winter storm needs to meet to be given a name is a topic I’m no authority on, but what I can say, as a life-long weather watcher, is that I have don’t believe any private entity should be independently naming storms. I am, however, all up for a public debate about the National Weather Service systematizing a winter storm naming program using a rule book that will be followed consistently year in and year out. Until this happens, though, news media outlets may continue taking it upon themselves to name winter storms, as the Weather Channel may surely continue doing from now on. It will only be a matter of time before we hear about Raindrop Sally or Tornado Alpha.